Saying that I love to try new recipes and techniques is an understatement. Even when I’m making a tried and true dessert that I’ve made repeatedly, I always have a crazy urge to try a new decorating technique or another twist. It was a wonderful decision, therefore, to join The Daring Bakers. Each month, one of the Daring Bakers is responsible for hosting a challenge that they issue to all of the others. Bakers complete the challenge and everyone posts their results on the 27th of the month. This is my first month in the group, and I can already tell I’m going to love it. The July Daring Bakers’ challenge was hosted by Nicole at Sweet Tooth. She chose Chocolate Covered Marshmallow Cookies and Milan Cookies from pastry chef Gale Gand of the Food Network (to see my Mallows, go to this post). First and foremost, I think the Daring Bakers will encourage me to try recipes I might not otherwise consider. These Milan Cookies, for example, aren’t something I would have decided to try on my own, but they are delicious and sophisticated. I can picture them being served at tea; they’re so prim in their little paper bowls! 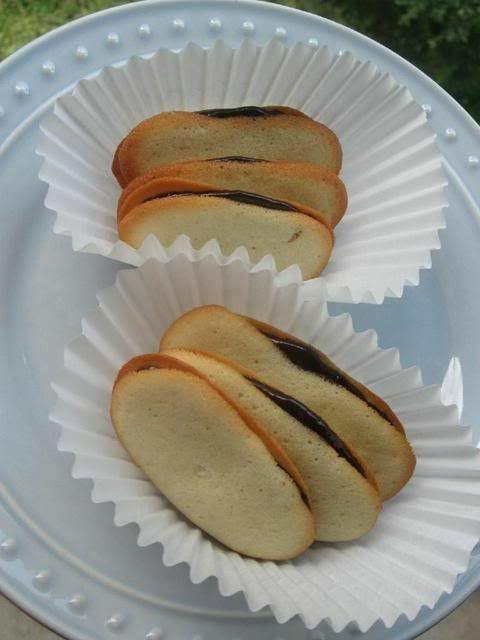 The cookie filling is a thick ganache with a hint of orange zest that complements the slightly citrus flavor of the cookie itself. Everyone who tried these loved them! Just a hint: I had some lemon curd frozen from my Lemon Burst Fairycakes, so I spread it on a cookie and gave it a taste. It was heavenly! You could even sandwich some lemon curd between two cookies and dip them in ganache! Clearly, these cookies have inspired me. 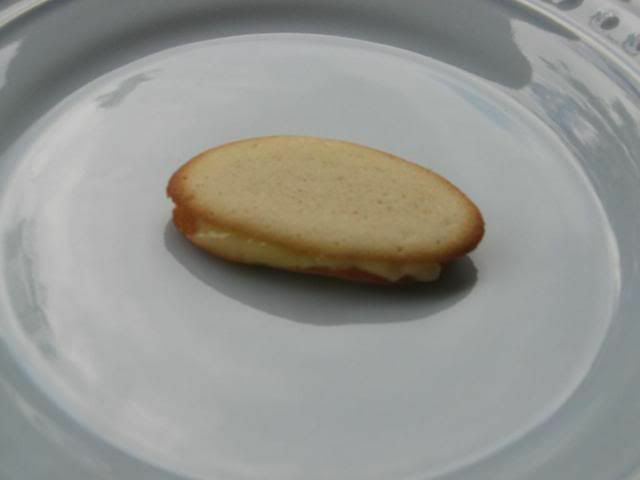 Milan Cookie with lemon curd filling in the place of ganache. This recipe is from Gale Gand and Food Network, but of course, I tweaked some things. Changes to the recipe are marked in italics below. I hope you enjoy these cookies, and be sure to send me a photo and/or leave me a comment if you make them! I’d love to see your results! Cream the butter with a paddle attachment then mix in the sugar. Add the egg whites gradually and then mix in the vanilla and lemon extracts. Add the flour and mix until just incorporated. With a small (1/4-inch) plain tip, pipe thick 2-inch sections of batter onto a parchment-lined sheet pan (note: it’s easier to pipe onto parchment if you “glue” it to the pan using some nonstick cooking spray), spacing them 2 inches apart as they spread. 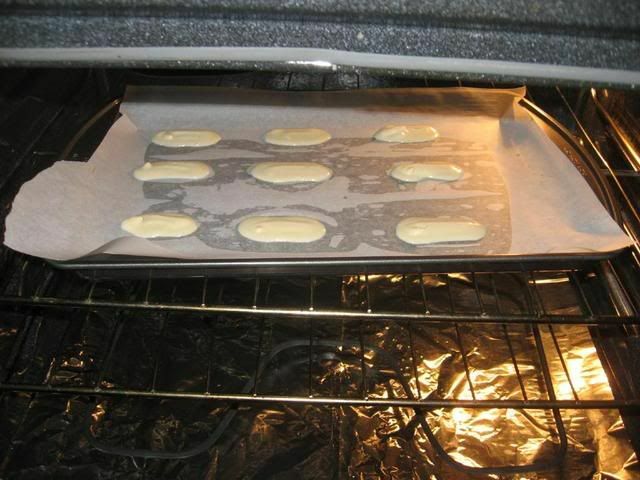 Bake in a preheated 350 degree oven for 7-8 minutes or until light golden brown around the edges. Let cool on the pan. Cookie Filling: In a small saucepan over medium flame, scald cream. Pour hot cream over chocolate in a bowl. 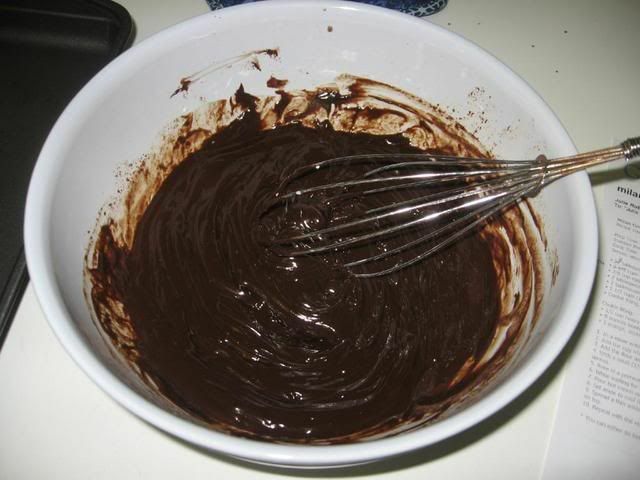 Whisk to melt chocolate, add zest and blend well. Set aside to cool (the mixture will thicken as it cools). 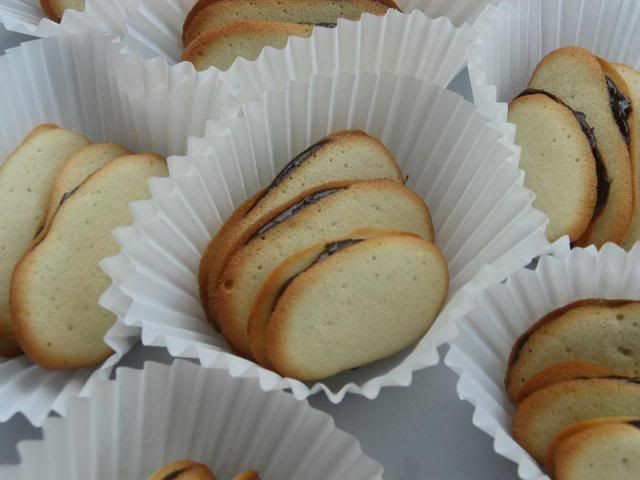 Spread a thin amount of the filling onto the flat side of a cookie while the filling is still soft and press the flat side of a second cookie on top. Repeat with the remainder of the cookies. NOTES on storage from Audax Artifex: Let cookies cool completely before storing them, or the residual heat will produce steam that will soften the cookies and accelerate spoilage. 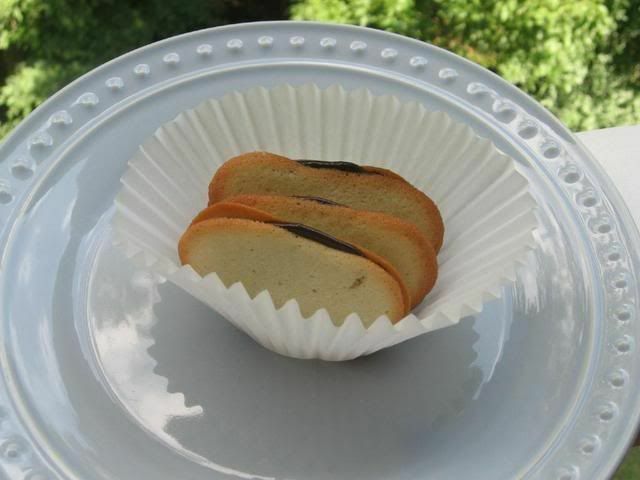 Separate layers of cookie with wax paper or foil. In a dry climate, keep unfilled cookies crisp by storing them in a loosely covered container, such as a cookie jar without a snug lid. In a damp, humid climate, store in a tightly covered container. Also keeping the unfilled cookies in an air tight container with a muslin bag of salt or bicarbonate of soda – this will absorb the dampness keeping your cookies crisp. All of that said, I will tell you, my cookies got soft. We actually enjoyed them that way, so don’t fret if yours aren’t as crisp on day 2. 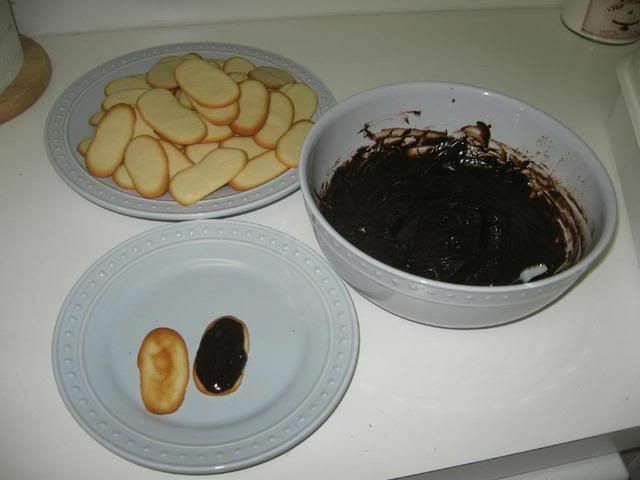 Many of the Daring Bakers also tried fun combinations — chocolate Milan cookies with chocolate mint ganache, plain Milan cookies with no citrus, etc. So do some experimenting! Visit the Daring Bakers (temporary) Blogroll to see more of these treats from amazing bakers! Since I mentioned challenges, what’s the most challenging recipe you’ve tried? Thank you, Lisa!! I just visited your blog and your cookies are BEAUTIFUL and I love all of your flavor ideas! Great job! Those cookies look very pretty and delicious! Thank you, Rosa! Loved yours as well! I love that you put your cookies in paper! Great job on your first challenge! I love the lemon curd idea! Thank you, Barbara! I’m headed over to see your cookies now! Great job on your challenge and your cookies look delicious. Love the addition of the little cup liners. Thank you, Jo!! I’m heading over to see your cookies right now! Super job–how ever did you get them to be so consistent in size? Not many did! Welcome to the DBs –you are going to rock it! Glad you are joining in the fun! Thank you, BumbleButton! I’m already enjoying it! A lot of them did turn out wonky, but I fed those to my boyfriend 😀 By the umpteenth tray of cookies, I was FINALLY PIPING in a straight line of uniform size . . . most of the time. Ha! 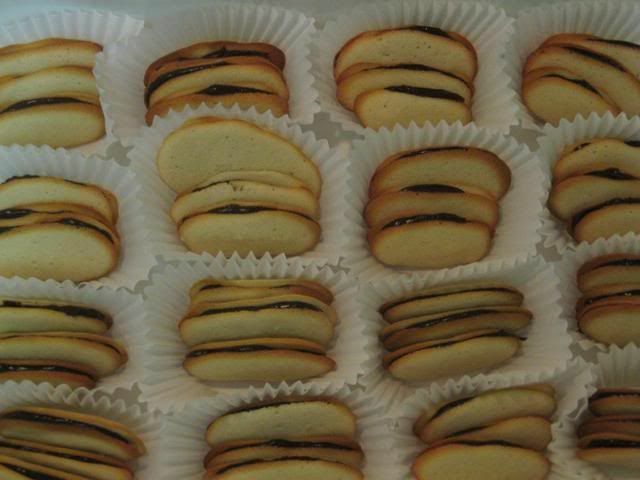 It would never occur to me that Milano cookie could be made at home instead of bought from Pepperidge Farms… Go you! Thanks Amelia! Any hints of a baby yet? You know, these Milanos were different than I expected. I think the regular ones don’t have the citrusy flavor, but it was nice. Some DBs also made chocolate mint milanos and other neat combinations. Yum. Yum, these look delicious…I love how you put them in the papers just like the “real thing”! I love the outdoor photos- your cookies do look perfect for a sophisticated tea on the lawn. Wonderful job. Thank you! I want to have a spot of tea right now! Why thank you, Basht! It was a great first challenge! Ooooohhh!! Yours look great! They’re such nice ovals. It was my first challenge too and mine didn’t turn out quite as pretty as yours. =) Great job and see you next month! Yum! 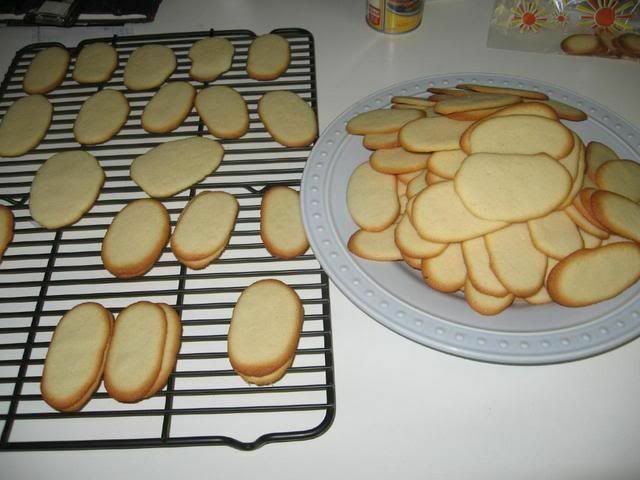 Your Cookies look amazing =D. Great job on your first challenge!! Yum – lemon curd! Sounds like a perfect match for these cookies! Thankfully it keeps in the freezer for 2 months, so I had some on hand to spread on some Milanos! These look tasty, and not too greasy either. Nicely documented. Mmm, lemon curd sounds divine! Wonderful photos! Very, very nice work on the Milanos! They’re absolutely perfect shapes — great piping! everithing loos very fancy congrats! Thanks, Jill! I already love it! Dar Julie, your blog is amazing you are doing such a great job, Thanks dear for your nice words really appreciate it !! Your milan & mallows cookies are amaaaazing !! Thanks, Chahira! I love your blog too; I’m still looking through it all! I love the music, and the sweet picture of you and your daughter! Your documentary photos are super! Thank you! I wish I’d tried dipping the lemon curd cookie in the ganache, but about 2 seconds after this picture was taken it was devoured!! 😀 Only THEN did I realize I meant to dip it. Ha. Well done on the challenge…lovely pictures too! The lemon curd filling sounds scrumptious. I did just the mallows, & they were fab! Thanks, Deeba! I loved the Mallows too! Yummm. your cookies are really great looking! yum beautifull photos!.. Your cookies are the perfect shape! I am envious, and love your idea for lemon curd filling. That would be so refreshing in the summer months. Welcome to DB and great job on the cookies. I like your presentation! They both look and sound delicious! But your Milans are absolutely delicate and beautiful! Gorgeous job, way to go! Congratulaions on a great first challenge, and welcome to the Daring Bakers! Great cookies, Julie! The paper liners really give the final “Milano” touch. Ah, and congratulations for your blog. Welcome to Daring Bakers and to the Food Blog World! 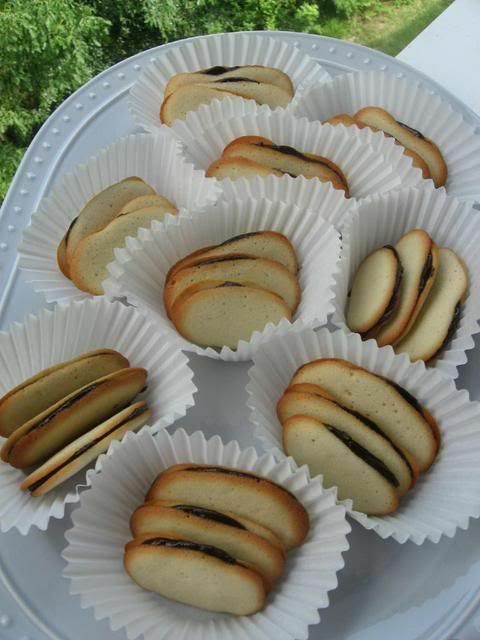 Thanks for stopping by my blog.Your Milano cookies look awesome …beautiful photos too.I missed making them…but after seeing all baker’s post am too tempted to make them today for myself…not for the contest though. Thank you, Nithya! Hope you enjoy them if you decide to! Great job on your first challenge! I love you idea of using lemon curd or another filling in the cookies. Can’t wait to make these cookies. I know they must be delicious. You have a great site! Thanks, Libby!! I hope you enjoy them! Thanks for visiting! Thanks, Gine! I’ve heard that macarons are terrifically picky, but I haven’t tried to make them yet! What’s challenging about the recipe? I wonder if they’ll be a daring bakers challenge sometime soon? I’d love to give them a try. And you know, I hate that I missed the croissant challenge, because I’d love to try making them as well. Fantastic job on your first challenge. I joined for the same reasons. It’s been a lot of fun to “have to” make something that I would not have necessarily tackled on my own. Delicious!! and your photos are also fantastic!! They are absolutely gorgeous! I love how they look in their little cups. They look better than the “real” ones! And I like the use of lemon curd…refreshing, and perfect for summer! The most challenging recipe I tried was gnocchi…but I got overambitious and started messing around with the recipe and of course the result was disaster! Thank you!! Gnocchi, eh? I would love to try and make that! Was that a Daring Bakers challenge? I’ve never made pasta of any sort! Thanks for commenting on my DB post! Thanks, Pam! I bet sorbet would be soooo good with these!! Your cookies are absolutely perfect – now that is impressive! If that’s what you can do for your first challenge I can’t wait to see what you do with the next one! Aww, thank you Sweet Kitchen!! I really enjoyed the challenge 🙂 Can’t wait to see what’s in store for August. You did such a fabulous job with this challenge! I love the little paper liners that you used…perfect! The cookies look great! Congratulations on your first challenge. I love the paper you used to hold the cookies – they look just like the real thing, only tastier. I’d love to try the one with lemon curd, mm..
Beautiful cookies! I love that you put them in the white liners. Thank you, Teenie! I had so much fun with the first challenge! Julie…it’s so nice to meet a fellow Charlottean! Please feel free to email me at ampenland at yahoo dot com and we can get to know each other if you’d like. Your photography is beautiful! Thanks, Alison! I’ll email you!